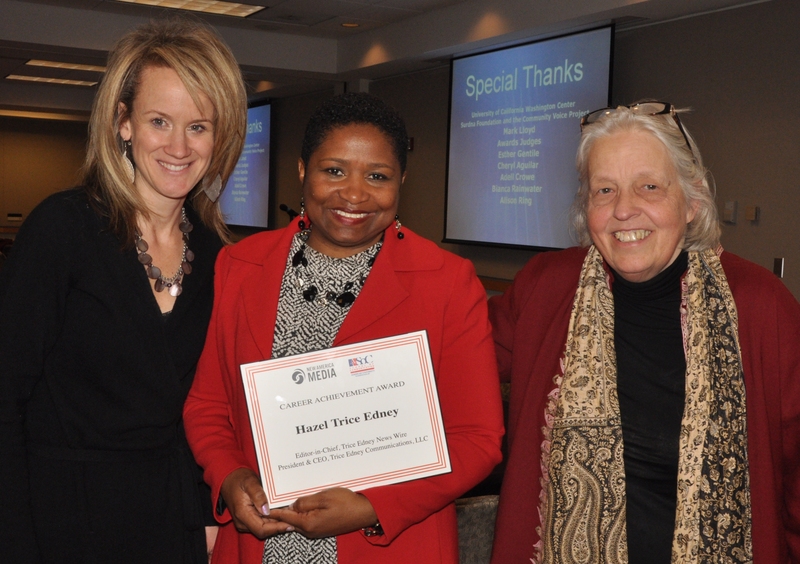 Hazel Trice Edney receives Career Achievement Award from New America Media's Alexandra Moe, NAM Washington, D.C. director, and Sandy Close, NAM executive director. WASHINGTON (TriceEdneyWire.com) - Hazel Trice Edney, editor-in-chief of the Trice Edney News Wire and president and CEO of Trice Edney Communications, was the recipient of the “Career Achievement Award” during the New America Media’s (NAM) Ethnic Media Awards last week. “For years, New America Media has recognized people whose leadership of their particular ethnic news organization has helped sustain and inspire the entire sector. The better term for this award might be exceptional communicator. But it also recognizes an individual's dedication and expertise spanning many years,” says Sandy Close, executive director, New America Media. Edney, a 25-year veteran of the Black Press, served as Washington correspondent for the news service of the National Newspaper Publishers Association for seven years and then as NNPA’s editor-in-chief for three years until she resigned last September. On November 19, she launched Trice Edney News Wire at the National Press Club. Winners of the Career Achievement Award embodies what the late Oakland Post editor, Chauncey Bailey, NAM’s co-founder, described as being “like the fingers on a hand: when they work together they make a fist. Hazel has been the glue that held NNPA together as a fist during what may have been its most challenging decade,” Close said. Edney, who was also keynote speaker at the event, challenged the audience of multiple ethnicities to “raise the bar” in their quest to “plead our own cause” even as White-owned media attempt to create Black news sections. “What is so incredible is that the same main stream media companies that have done such an embarrassingly poor job of accurately portraying people of color on their pages and broadcast outlets are now seeking to create sites to report our news - Black news – colored sections - if you will, for economic gain,” Edney said. “I send a message to them now that you would never have to create a separate section for us if you integrated us and our issues onto your front pages in the first place,” she said to applause. Edney, who started her newspaper career with the Richmond Afro-American Newspaper in 1985, was subsequently staff writer for the Richmond Free Press for eight years. After a master’s degree program at the Harvard University John F. Kennedy School of Government and a one-year congressional fellowship, she was recruited to NNPA by then NNPA executive director, Ben Jealous, now NAACP president & CEO. Jealous received a similar NAM award in 2000. The Trice Edney News Wire logos describes the news service as “provocative, empowering, unapologetically Black”. First Place: “Mexican Immigrants Returning to their Homeland,” Anne L.